Although there are thousands of existing bonefish patterns, spend any amount of time around dyed-in-the-wool bone fishermen and you will find that that the Pareto principle (also known as the 80–20 rule) definitely holds true. 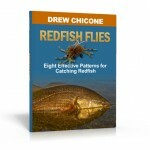 Only a small assortment of proven patterns earn a spot their fly boxes, no matter where they intend on fishing. Friends, guides, travel literature and most importantly personal on the flats experience have narrowed my list of must have bonefish flies down to 7 essential patterns… in no particular order. Ververka’s Mantis Shrimp, Cownes Bonefish Scampi, McVay’s Gotcha, Owen’s 90 Percenter, Chicone’s Tranqu-Hill-izer and Bone Appetit and Ginevri’s Avalon have all proven to be highly productive for Andros Island in the Bahamas. Understanding where the fly was intended to be fished, what factors led the designer to choose the materials he did, and why the pattern has evolved helps to give you the whole picture. Interviews with the fly’s designer will give you a peek into the heads of some of these innovative tiers and should help you to understand how they think and create new patterns as well as gives you a insider’s perspective, valuable insight, and hopefully encouragement to create your own unique patterns. 7 flies that must be in your box for stalking the big Bone lurking around Andros Island, Bahamas 98 page downloadable pdf. illustrated with ultra-hi resolution images.